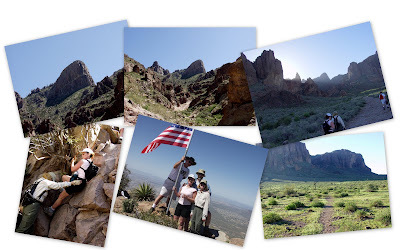 The Lost Dutchman State Park named after the fabled Lost Dutchman Gold mine somewhere in the maze of canyons east of Mesa has a host of trails and hikes. One of the more interesting and difficult trails is the summit trail that leads to the top of a rock outcropping called “Flat Iron”. The name comes from the unique prow shaped likeness to the back side of an anvil or flat iron as they used to be called. It also happens to be the highest peak in the area, so that means you have to stand on top of it right? The hike has to being early because even though it still a bit cool in March the afternoon will get scorching hot on the tops of the peaks, so you need to be in and out before to late. Online reviews of this trail indicated that it was a tough trail, but only about 3 miles one way. How tough can a 3 mile trail be? As we approach the canyon that leads to the top from the west side most of the trail is still bathed in shade at this early time of day. All along the trail are beautiful wild flowers blooming from the spring rains. The morning sun makes for interesting images as you walk along the trails in and out of the shadows. Things seem to be getting a little rugged don’t they? Maybe that’s what they mean by a tough trail? A break in the shade and a bit of conversation. Are you sure this is the only way to the top? From our perch in the ravine working our way up the “not so steep side of the peak”, looking out at the edge of Flat Iron. It gets better from here doesn't it? Once over the lip at the top its really flat! You could land a plane up here! It looks like someone has planted an American flag on the edge of the cliff. A victory celebration with a glass of wine for standing on the highest rock around! Summit photos courtesy of another hiker that made it to the top. Looks like going down is no better than going up. I wonder who is helping who here? Looking back on a very satisfying hike on the way out that will provide good memories for ever.